Tnchick said the word for today's Photo Hunt is WRINKLED. I bet you thought I was going to show you MY wrinkles.... Ooohhh no! Here are wrinkles on my new sofa. When I sit in the corner there I wrinkle the back cushion. then I have to straighten it out and make it look nice after I sit there. 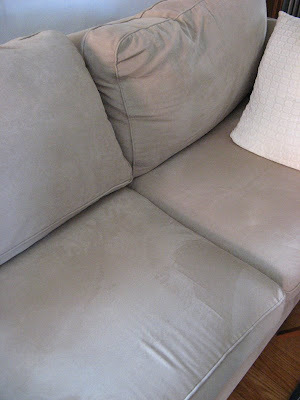 I also switch the back cushions and that works to keep them looking new. that looks exactly like my couch. My post is here. Have a great weekend! That's a great photo for the theme! I don't think I'd want to show my own wrinkles. At least, not up close! I make my way through wrinkles ! so far only fabric ! I wanted to take pictures of wrinkled hands here in our Retirement home, but they had all disappeared for supper ! Looks like comfy cozy seat... one you can just plop down on! My couch has more wrinkles, and I considerd it for the theme, but thought of something else at the last minute, posted at The Cafe sweet one! That's a common problem with sofas but it looks nice wrinkles and all. Looks like a comfy sofa Mary! That looks like that so soft micro suede material. I wonder. Hmmm. I'm so laughing at Judi's comment! I shared ‘wrinkles’ on both blogs today. A clever response to wrinkles! But I still think wrinkles add personality, even to a sofa! Looks like such a comfy couch! It's hard to keep those cushions looking like new isn't it? !